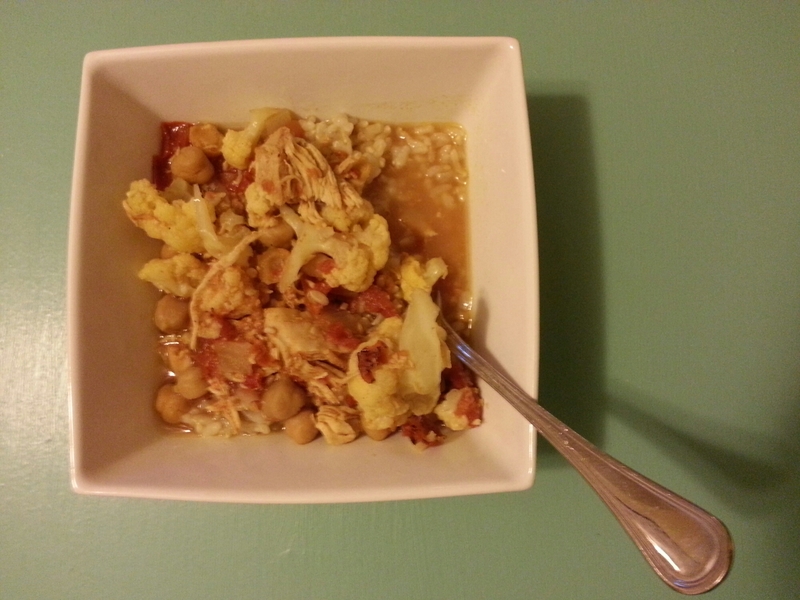 I put all except the cauliflower in the crock pot, which I set on high and let go for 2.5 hours. I reduced the temperature to low and continued cooking for about 2 hours. Then I stirred in the cauliflower and let it go for about another half hour to 45 minutes. Bring to a boil and simmer for 50 minutes. I used the proportions that were on the rice package, but I think it would have been better with just four cups of liquid. The picture doesn’t look amazing, but the recipe is quite YUM. Double the curry powder or add some turmeric if you want it spicier. Add salt to taste if your canned tomatoes didn’t contain enough to flavor the whole batch. The curry is also good with a little plain yogurt mixed in.